Cassie Stephens: Art Room Rainbow Tree (and a New Mural)! I have been chompin' at the bit to share my Rainbow Tree from Treetopia with y'all...and today is the big day and big reveal...so here she is in all of her Roy G. Biv glory! 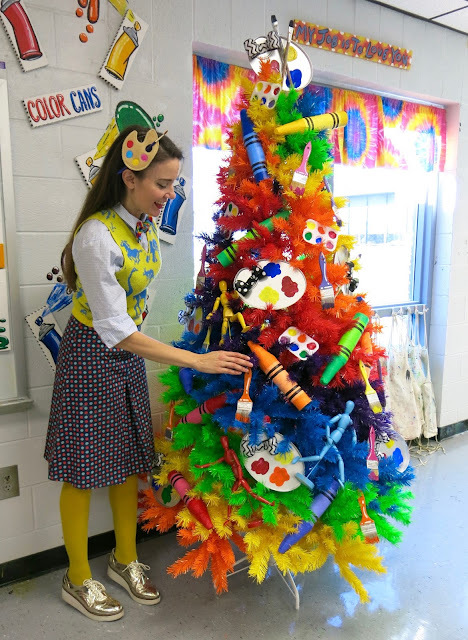 Because this tree is for the art room and will stay up all year, I am not calling it a Christmas tree. We have a rainbow (ahem) of beliefs at my school and I would never want anyone to feel excluded. 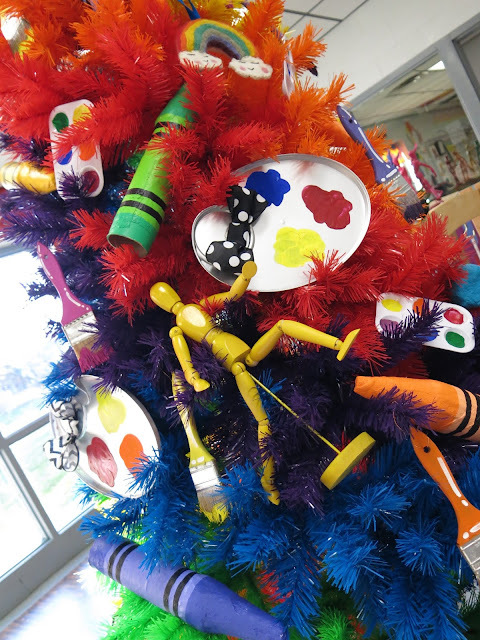 Therefore, it's an all-inclusive art teacherin' tree that I've decorated with art supply ornaments! I had the tree delivered to my school and it arrived in just under two days. 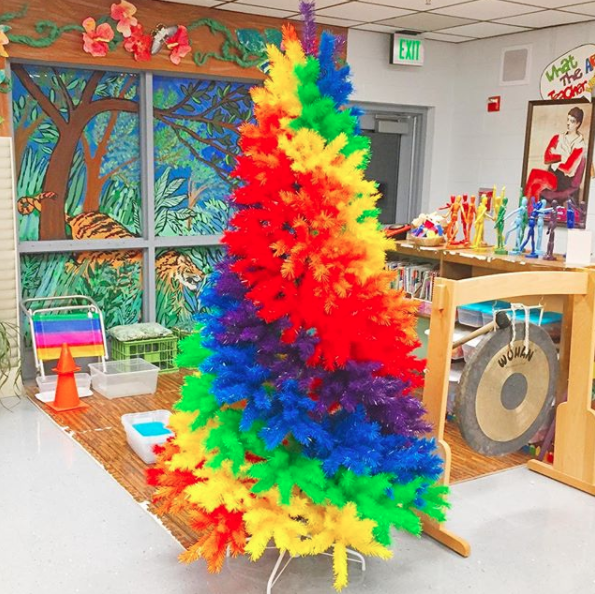 The box, which was labeled RAINBOW TREE caused quite a stir in the front office. I had folks dropping by all day to see if I'd unboxed the tree yet. I waited until after school and had the help of my P.E. teacher buddy Ali to put the tree together. It went up in just under 15 minutes! 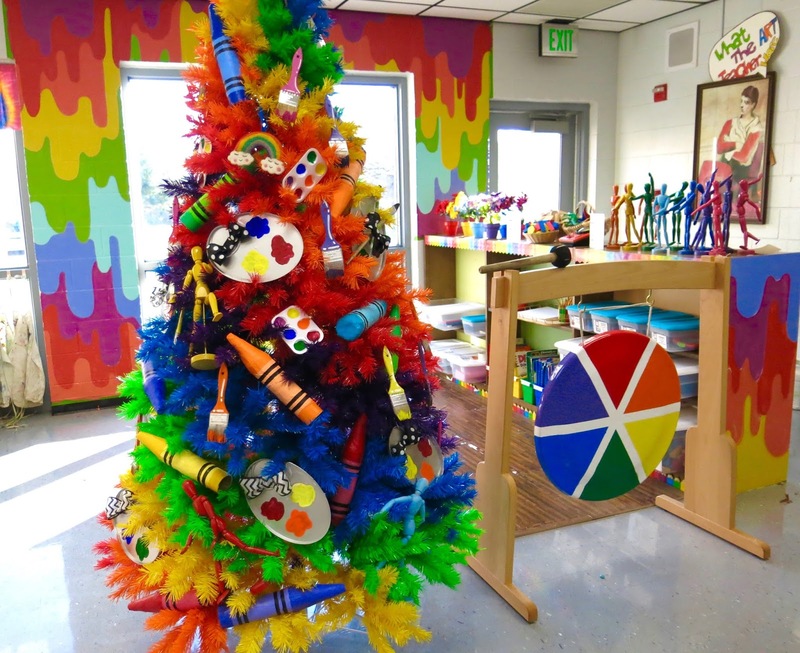 We got the tree up just under two weeks ago...looking at this photo, I can see just how much has changed in this area of my art room! That's right, this tree pushed me over the decorating edge! It inspired me to spray paint my gong (which has now become such a wonderful color wheel teaching tool), tear down my jungle lounge paper'ed walls and paint my walls (more on that shortly) and wash off my window (with the help of some third grade kiddos). I'm so excited how this space is transforming! You can see more on what I've got in store for this space here. Basically, this tree now has me viewing my life thru rainbow colored glasses...and I'm 100% cool with that. Now. Let's address what the tree had me doing to the rest of this space, shall we? I couldn't very well keep the jungle theme going with this blazing bright baby of a tree, could I? 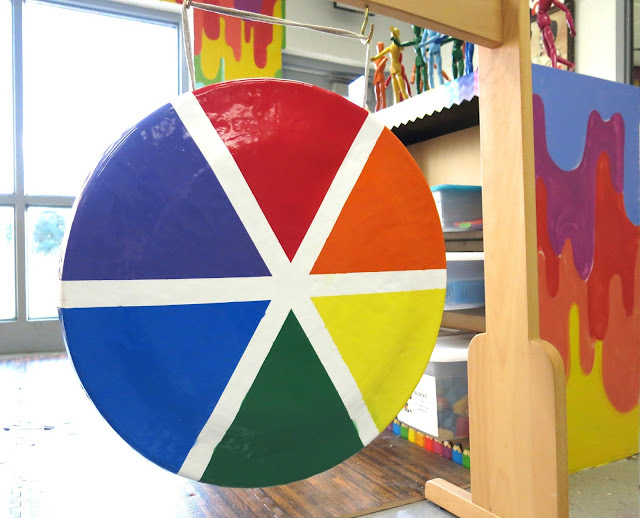 So when Mitch suggested I paint the gong he gave me for our 10 year wedding anniversary, I went for it. Days of rain prevented me from getting that done in the timely manner I wanted...but it's complete and I couldn't be happier. 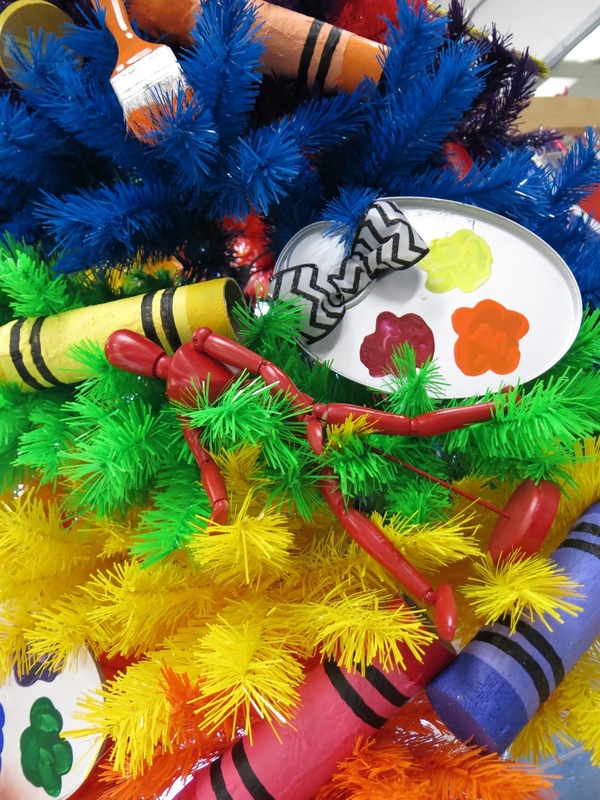 It looks like art candy! I started by painting it completely white...with many layers of primer. Then I taped it off and went section by section with paint. It's such a happy surprise when you walk in the room. The kids are LOVING it painted! I had a lot of fun doing this...and it really set the tone for the units we studied. 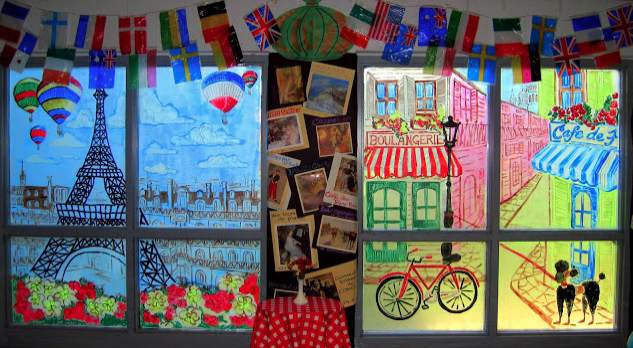 You can catch more views of my Paris themed room here. It's so interesting to see my room like this. 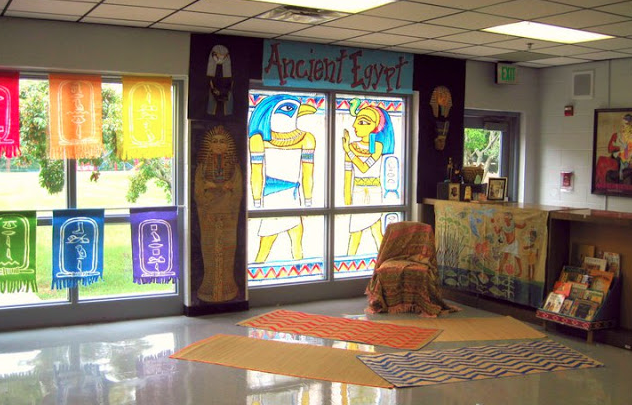 While beautiful (according to me), I love that this area of my art room is taking on a new life...one that the kids can really utilize and explore. Also...seeing that Picasso painting STILL hanging in that very same place...I realize IT.HAS.GOT.TO.GO. When I cleaned my windows, I fully intended to repaint them. And I might very well still do that. It gets SUPER hot in this area of my room and nearly half the class gets blinded by the daylight savings time sunshine that blasts thru in the afternoon. However, right now, I'm enjoying the light...so we'll see. I'm telling you, I've been INSPIRED this year to make some big changes. I've heard feedback from folks that I need to rest, that I'm going a little overboard, that I need to chill...but I'm telling you, I'm excited! Inspired! And I don't wanna stop. I was going through a SERIOUS burnout at the start of the school year. I'm so over it. And I'm so glad. I don't mean to show out or show off...I'm just truly thrilled with this thing called art teacherin' and determined to be the best that I can be. Sidenote: spray painting the daylights outta a very nice and very expensive gong WILL ruin the integrity of the sound. Le sigh. But it sure is pretty! So, what's up next? A new floor, a possible window painting and more things added to this area for my early finishers. AND removing that Picasso painting. Puhlease. As for the tree, it's not going anywhere...I LOVE it and it's staying up forever, according to me. I think it will be a super fun addition to the art room. We've already used it as a teaching tool...and already sweet kiddos are bringing in ornaments for it and drawing pictures of it's amazingness. 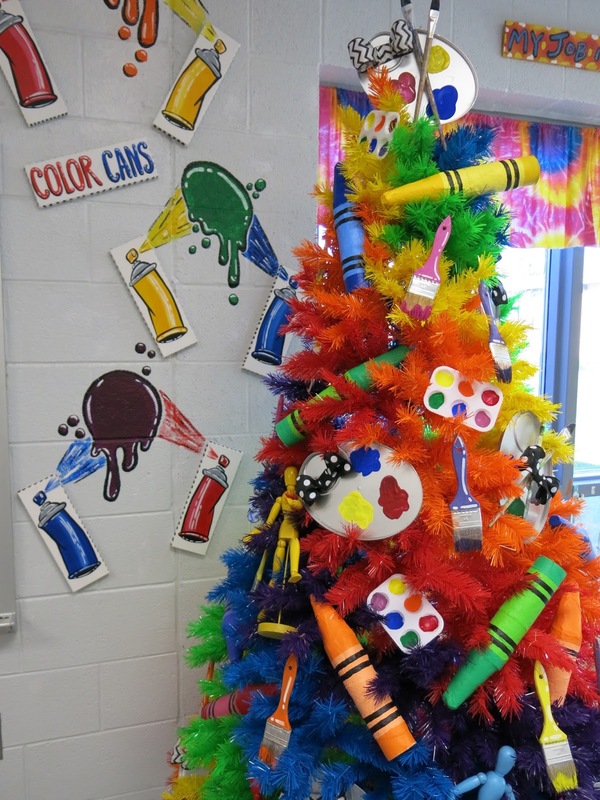 I see this tree getting a new theme every now and then....but until then, it's going to remain the art supply tree. 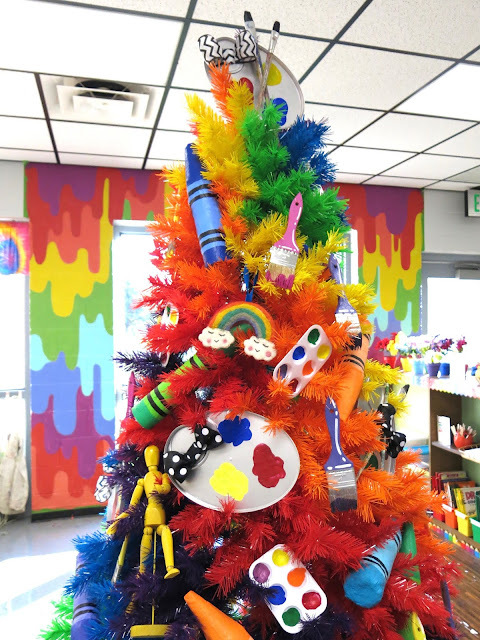 Thank you so much Treetopia for this spectacular addition to the Johnson Elementary Art Room! Love it! 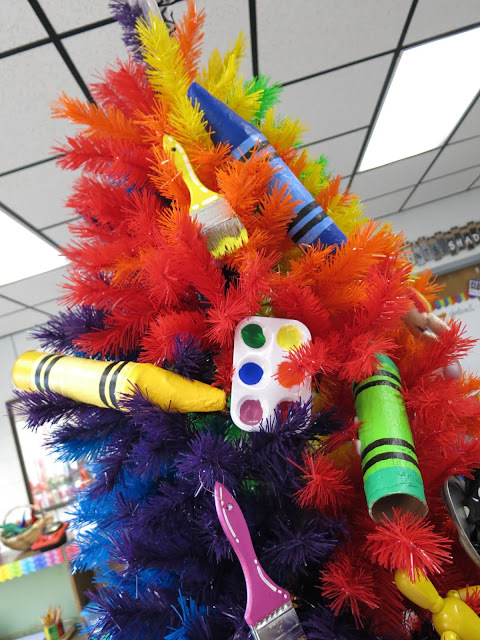 I used to tape actual crayons,markers,scissors and other art supplies to my little Art Room tree! 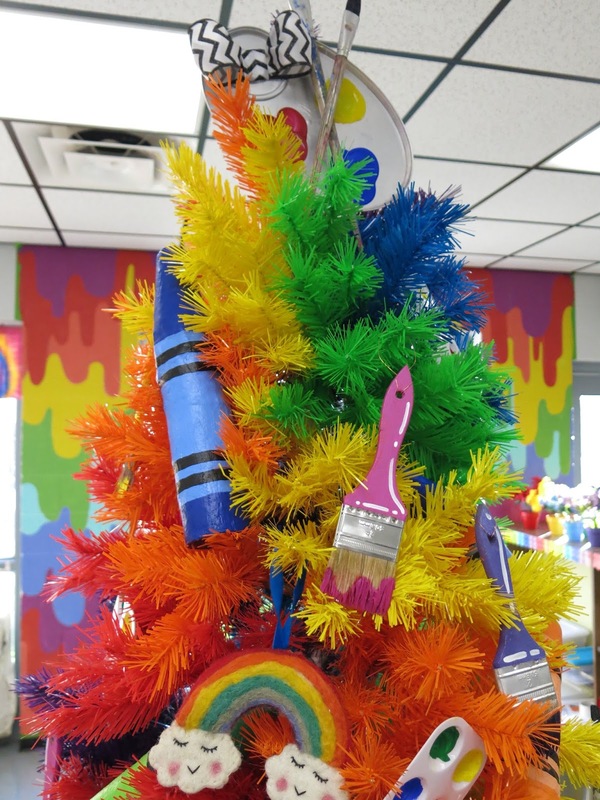 Your rainbow tree is divine! 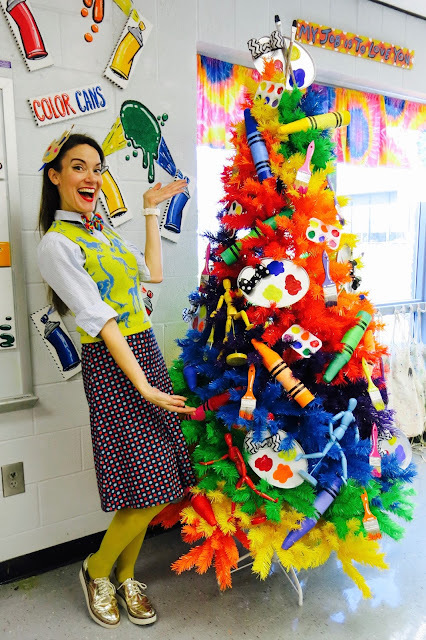 And I can easily see you decorating it to fit in with your themes through your classroom year while still inspiring your students to love colour! 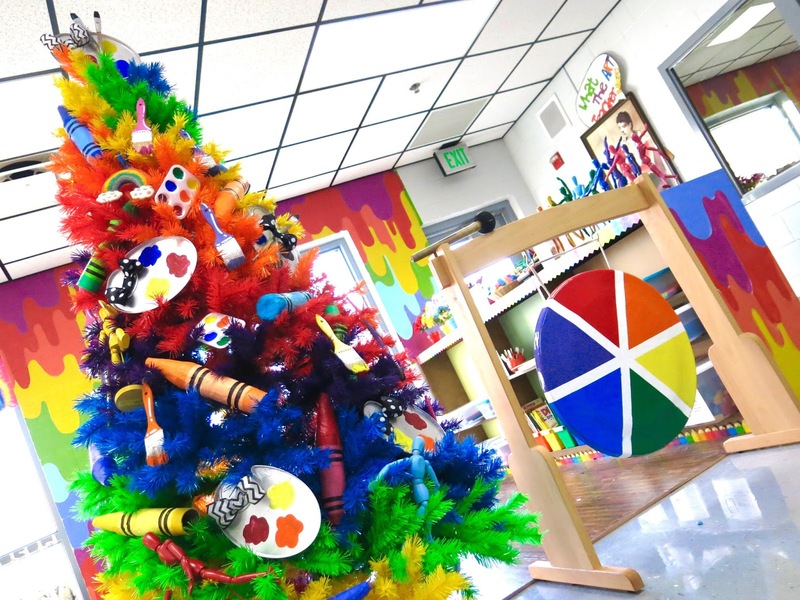 i'm in the middle of overdue report writing exhaustion, at the moment, and your rainbow tree has cheered me up no end! And now I will focus back on what I am supposed to be doing. Did you paint the drawing mannequins? If so, what did you use? 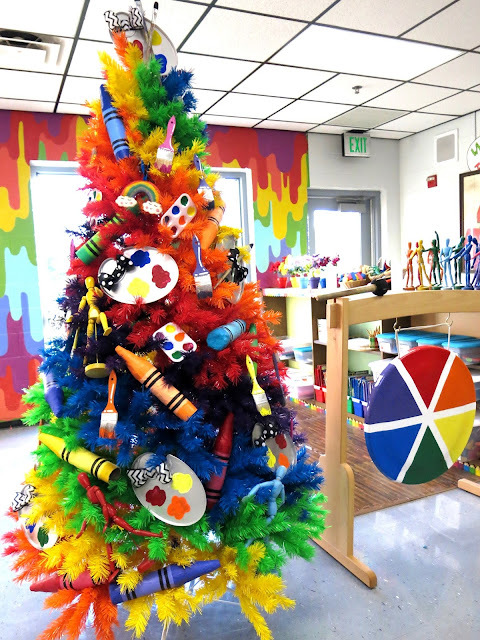 I now want a rainbow tree in my house. I never knew one existed before now. I can see & hear your passion to teach, I can feel your enthusiasm. Oh those children are some of the luckiest children in the world. Perhaps if I had had such an awesome teacher forming my creative mind, I'd be a better Human for it. 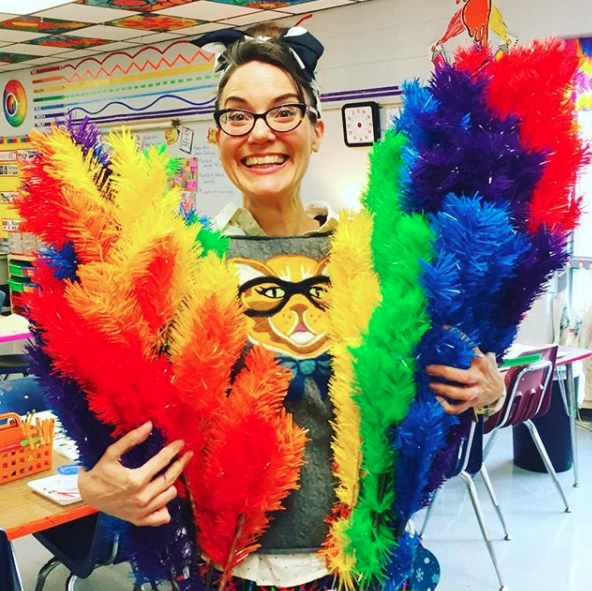 I send you all the happy, color filled vibes in the universe as you teach now & forevermore. ♡ you are so cool! I love love love your Creativity!!! Buy fridge online and keep your eatables fresh. ^ However is posting these testimonials, you are invading Cassies's space. This is not the place or forum for these types of posts. Please create your own website! In the Art Room: Second Grade Super Hero Selfies! DIY: TP Tube to Paint Tube Ornament! In the Art Room: Britto-Style Selfies! 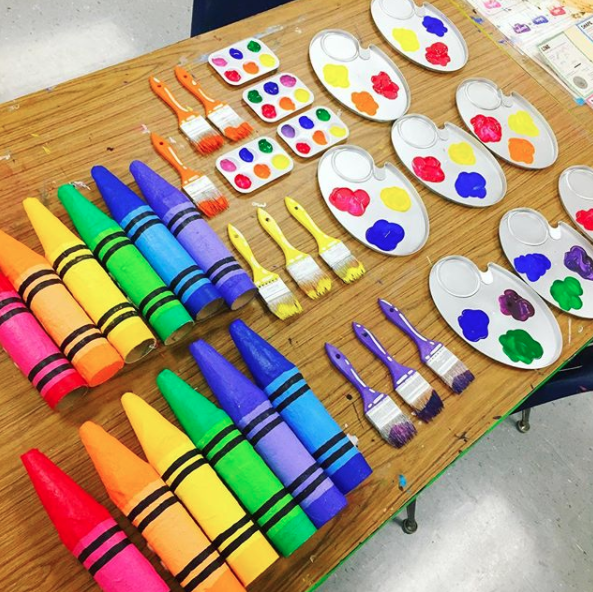 In the Art Room: Royal First Graders!